Halfway through the sales with the 20th Centurya and Contemporary sales done, Christie’s has sold $48 million worth of art. 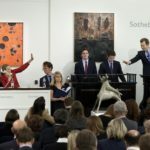 Its Asian Contemporary and Chinese 20th Century Art sale made $23.4m with each of the Zao Wou-ki paintings sold from Harvard exceeding the estimate range. The top Zao made $4.5 million.